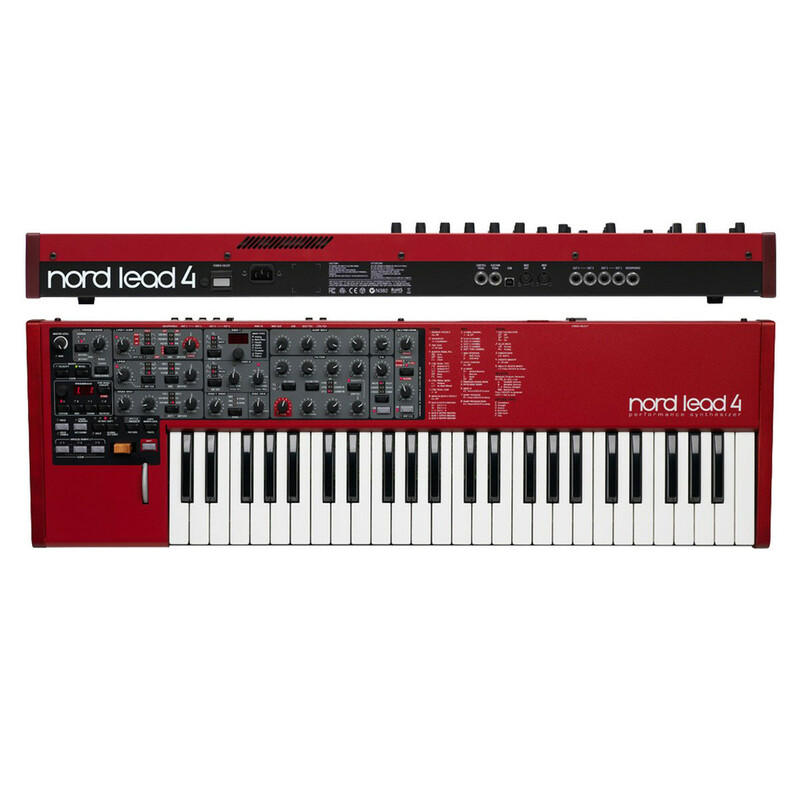 The Nord Lead 4 Performance Synthesizer Keyboard is a 49-note, 4-part multi-timbral synthesizer featuring 2 oscillators per voice and 20-voice polyphony. 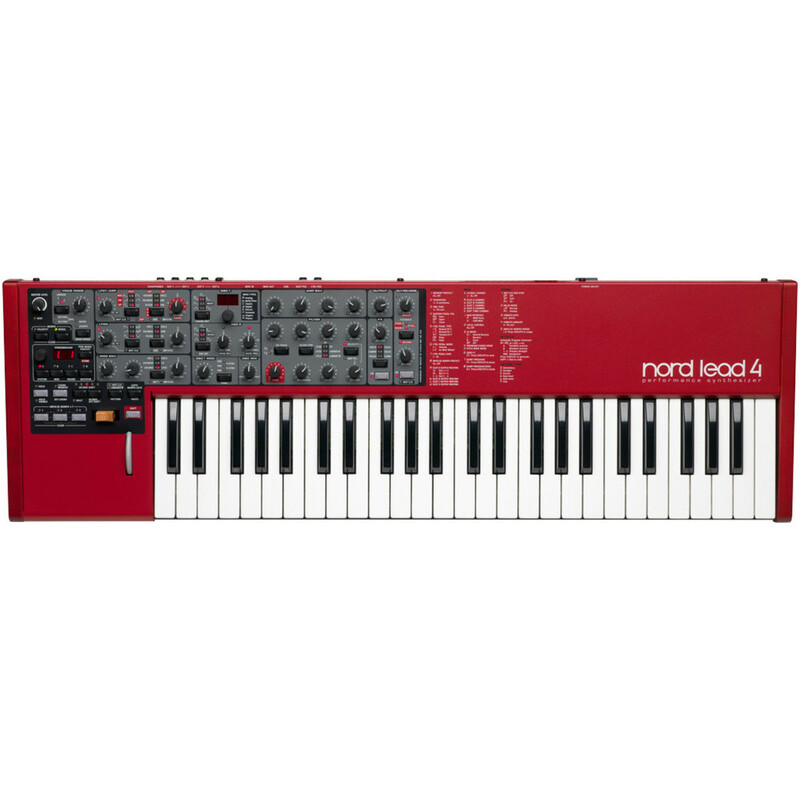 The Nord Lead 4 is the ultimate performance synth, jam-packed with performance enhancing features such as the integrated filters and multi-timbral design. It boasts two LFO sections as well as a modulation envelope. The oscillators feature FM, Hard and Soft Sync modes. The Lead 4 is a subtractive synth with a range of selectable waveforms including Saw, Square, Sine, Triangle, Pulse and PWM. It also features built-in effects for added expression including a compressor, reverb/delay, comb filter and others. The Nord Lead 4 is a powerhouse of a performance synthesizer, boasting built-in effects, performance features and a 4-part multi-timbral design. 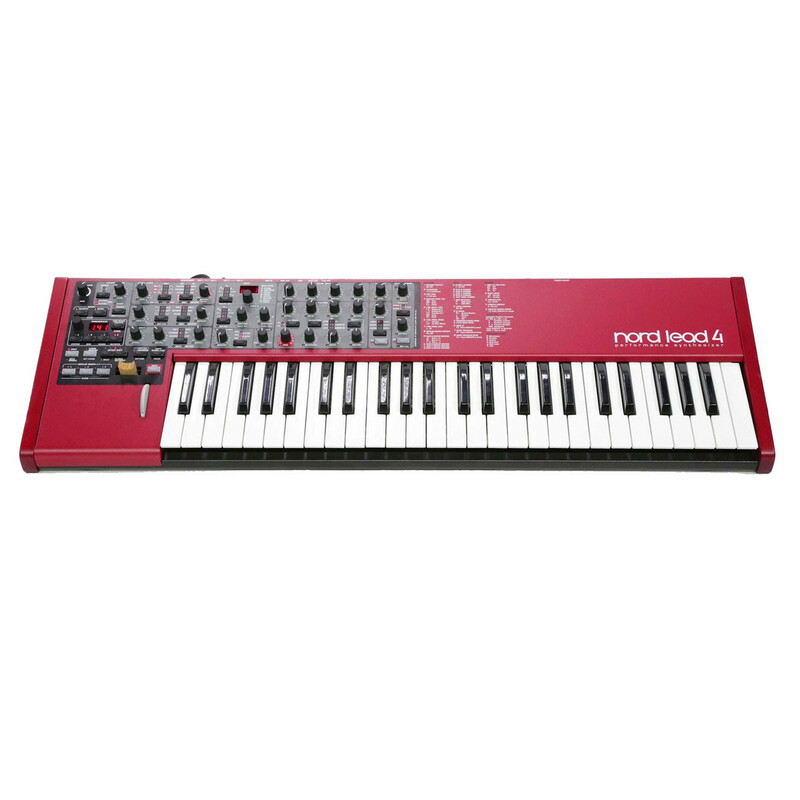 The Nord Lead 4 features a 49-note velocity-sensitive keybed complete with octave shift buttons. The velocity-sensitive keybed provide fluid playability, emulating the feel of a traditional grand piano for added expression. At the heart of the Nord Lead 4 is the oscillator section, providing two oscillators wiper voice with 20-voice polyphony. The subtractive design features classic waveforms such as Saw, Square, Sine, Triangle, Pulse and PWM. The 4-part multi-timbral design allows you to produce two more sounds at the same time, great for combining sounds and creating your own. The oscillator section features a wide variety of wavetables, including the unique Formant Wavetables. The Formant Wavetables delivers a unique sound with resonant qualities independent of the pitch. When modulating the frequency of the Formant Wavetables, it can result is some truly out of this world sounds, with distinctive tonal character. The true Voice Unison mode allows you to layer up to four voices on top of each other per note, allowing you to create powerful sounds with ease. Hard Sync allows you to generate irregular waveforms, resulting in truly unique harmonics. A frequency Modulation also allows you to sculpt your sound, providing the means to add spectral complexity and even brash, aggressive tones. The Nord Lead 4 includes dual versatile LFO-section per slot. The synth provides a wide variety of LFO-shapes, ranging from sines and pulses to cutting-edge saws. This allows you to create a range of sounds from wobbling basses to soft pads. Each LFO can be synced with the Master Clock and can be re-triggered manually with the Impulse Morph functionality. The modulation Envelope section provides even more ways to expand your modulation destinations. It can also be triggered manually for added flexibility. The filter section is comprised of a range of varying filters including the classic 12, 24 and 48dB Low-Pass, High-Pass and Band-Pass filters. Dedicated ADSR filter envelopes are also included as well as selectable filter tracking. Two ladder filter are also included, incorporated from famous synths designed to capture the essence of the vintage sound. The Filter Drive option allows you to operate separately per voice, distorting the waveform before it hits the effects section. The built-in effects section makes the Nord Lead 4 perfect for live performances. Each of the four slots features its own dedicated effects section of FX and delay/reverb. The built-in effects are comprised of: Drive, Talk, Compressor, Crush, Comb Filter & Reverb/Delay. These specialised effects can be used for a variety of applications, from adding extra tonality to your sounds to enhancing your live performances. In addition to the effects, the Nord Lead synthesizer features a built-in arpeggiator with up/down and random modes. It also includes layering support, chord memory and a pitch sticks for maximum versatility. The eye-catching signature red finish, not only looks sleek but makes the synth stand out from the crowd. 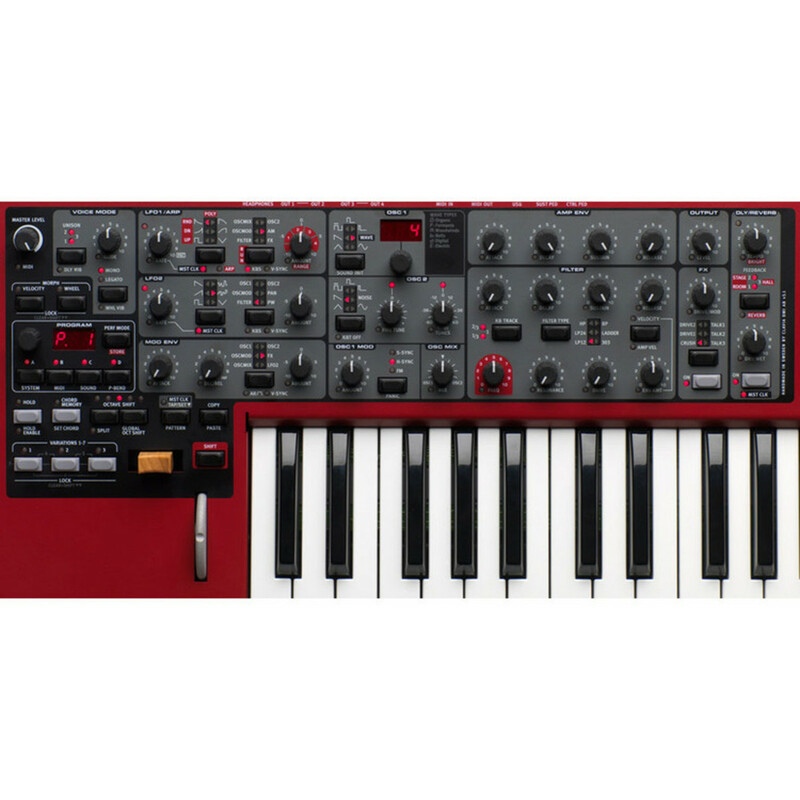 Nord is renowned for its bright red colour scheme, becoming one of the most distinctive synth keyboards out there. The robust design provides optimal durability, ensuring your keyboard can withstand the rigors of extensive live use. Not only is the synth robust but it is lightweight, measuring at only 5.3kg, making it easy to transport your keyboard. The rear of the keyboard features a range of connection including four line level audio outputs, a stereo headphone output, sustain pedal and control pedal jacks, as well as a USB connector with MIDI capabilities. 49-key velocity sensitive keyboard (C-C) (Not Nord Lead 4R).